Here lies Kristiana Coignard. She was 17 years old. She was shot five times in January 2015 by two Longview, Texas, police officers inside their own department lobby. 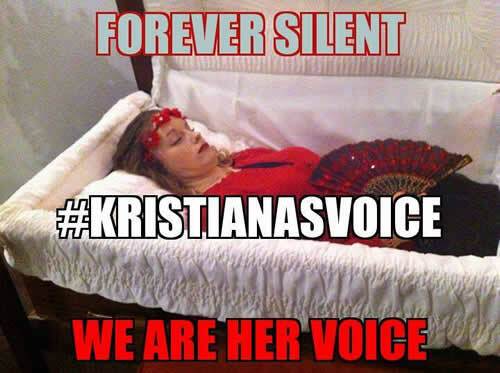 We may never know why Kristiana happened to be inside the police station nor why she picked up a courtesy phone because minutes later she was shot dead on a Thursday evening at 6:30 p.m. Kristiana didn’t make it home to dinner that night because the people who were supposed to protect her, tazed her and put five bullets in her instead of getting her therapy and calling her parents. The three officers involved are now on a paid vacation. The Longview Police Department did not release the video of the murder until days afterwards. Thus far, the Longview Police Department “official” story has not matched the now-released video (https://www.youtube.com/watch?v=oGIS1Knpvs0&bpctr=1422738506). Officer Glenn Derr tazed Kristiana first and then shot her three times. Officer Grace Bagley was on the scene for five seconds when she shot the already on-the-ground Coignard twice. Longview Police Chief Don Dingler claims Kristiana was wielding a butcher knife although it is hard to tell in the video if there was indeed a weapon. To date, no such butcher knife has been placed into evidence for this homicide. The three officers involved (Gene Duffie arrived on the scene but did not shoot his gun) are now on a paid vacation. Are you tired of cops killing our kids? If our “peace officers” can’t get a knife out a mentally ill teen’s hands and shoot her dead instead of helping her, don’t you think there is something wrong with the police in this country? Be ‪#‎KristianasVoice‬ and tell the city of Longview, Texas, and Longview Texas Police Chief Don Dingler as well as the mainstream media what you think of this travesty!